Who Lie: Military or Fake Twitter? After Nigerians begin react to wetin military talk wen dem say dem dey monitor social media, e be like say di Nigerian military don dey sing another tune. 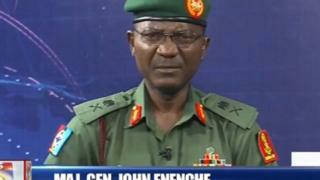 Major General John Enenche wey bi Director, Defense Information, wey first talk say di military dey monitor social media, don change mouth for di second time in four days. Im tell BBC News Pidgin say e never talk so. Im say na one "fake" Twitter handle lie say di military dey monitor social media for Nigeria. To show say im dey serious about wetin im dey talk, Major General Enenche add say dem don report di "fake" handle to Twitter make dem block am. But dis na how far im talk go fit sweet reach. Trouble be say e be like Major General Enenche don forget say im appear for one television station in Nigeria wey dem dey call, Channels TV on August 22. For there, wen im dey talk about "National Security: The New Challenge before security forces," di director, defense information talk say di military get wetin im call "strategic media centres wey dey monitor social media. "We dey monitor social media to be able to pick out and react to di ones wey dey anti-government, anti-military, anti-security...we go tackle dem appropriately," na wetin Major General Enenche talk be that. A day after im talk dis one, Major General Enenche talk to BBC and im say make Nigerians no dey fear. E say though dem dey monitor wetin people dey talk ontop social media, dem no fit arrest anybodi. Now, im don change mouth again, come talk say di military never say dem dey monitor social media, at all, at all. But dat one still no stop Nigerians from talking how dem feel about dis matter. Many Nigerians talk say military no get right to dey monitor social media. Dem talk say dat one fit be say government no wan make people get freedom of expression again. Social Economic Rights and Accountability Project, SERAP, wey bi NGO, don write letter to President Muhammadu Buhari say make im use im office take direct di military make dem no dey monitor social media for Nigeria again. Dem talk say any attempt by di military to monitor social media fit be wetin dem call "invasion of privacy." Image example President Buhari: "People dey cross national red line on top social media"
Na President Buhari start di wahala wen im talk say as im dey London, UK, dey receive treatment, im dey follow wetin people dey talk for social media for Nigeria. E say im no like as some of dem be like say dem dey cross wetin im call, "national red line." Na after di President talk this one na im, Major General Enenche come put mouth for di matter, talk say di military dey monitor social media. But as im come dey blame one "fake" Twitter handle for di report now, wetin we never know na who im go come blame for di one wey im talk on top television?